The Daily Mail’s website might be the world’s most popular English-language news site, but that has not spared it from being flagged for fake news. People visiting www.mailonline.co.uk on their phones while using the Microsoft Edge browser are receiving a pop-up message warning them that they should “proceed with caution”. “This website generally fails to maintain basic standards of accuracy and accountability,” the warning continues. It becomes even more damning when users click through to get some more information about the warning. 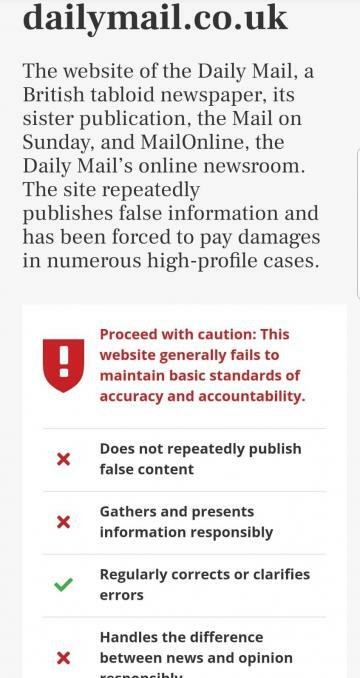 A warning pops up when visiting the Daily Mail website. “The site repeatedly publishes false information and has been forced to pay damages in numerous high-profile cases,” it states. The pop-up – which comes courtesy of media trust initiative NewsGuard - is part of Microsoft’s effort to battle fake news. NewsGuard is a media verification service which seeks to rank leading news websites according to a series of measurable criteria, from their willingness to correct inaccuracies to avoiding clickbait headlines and avoiding verifiably fake content. It has recently been integrated into the mobile version of Microsoft’s web browser Edge, as part of the computing giant’s Defending Democracy programme. The MailOnline boasts that it is the world’s largest English speaking newspaper website, highlighting an eye-popping 24.4 million monthly unique visitors. The news outlet has nevertheless been repeatedly slammed for violating press ethics and found to have violated UK press standards 19 times between December 2017 and December 2018. When contacted, NewsGuard co-founded Steve Brill told The Guardian that the MailOnline newsdesk had declined to speak to its assessors. “The analyst that wrote this writeup got someone on the phone who, as soon he heard who she was and where she was calling from, hung up,” he said.